Suitable training enables acquisition of the skills, knowledge and attitudes necessary to ensure competency in all aspects of work, including health and safety. Training should embrace initial inductions, formal off-the-job training, individual and group instruction and job-specific training. Competency requirements should also form part of the initial specifications for a job or activity and individual training needs should be determined before starting work and then reassessed periodically as work progresses. 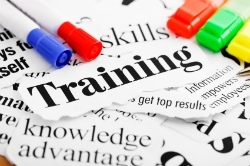 We provide off-the-job training on a range of topics using both in-house and external training providers. Sessions can be booked via the course diary. e-learning courses are also available and enable large numbers of people to be trained at a time and at a more convenient location. To suggest a course topic or to discuss more local training for a group of people then please get in touch with us as we may be able to arrange this on-demand. You can also contact us if you would like to discuss any aspect of training or competency more generally. This video describes guidelines and best practices when undertaking cell culture. It is provided by the European Collection of Cell Cultures at Public Health England (ECACC) and Sigma-Aldrich. The video is accompanied by a reference manual which is available to download under related resources. For further health and safety guidance, including risk assessment, please see the biological safety guidance section on this website. This video will open in a new window and is streamed directly from Sigma-Aldrich. A higher quality DVD presentation is available for groups to view in the Safety Training Room at Safety and Health Services by arrangement in advance with the Biological Safety Officer. Any member of staff using a computer should complete this short course (developed and made available by Loughborough University). It will enable you to set up your workstation correctly, and work comfortably. It is recommended that this is completed at induction and every 12 months. The course is applicable to both NWoW and traditional working arrangements. For more information on DSE and the assessment process please see the DSE guidance section on this website. This training is aimed at all members of staff and covers essential fire safety information including staff responsibilities, what to do in the event of a fire and how to help prevent fires occurring. The University takes its responsibilities for fire safety very seriously and is committed to achieving the highest possible standards. This training provides a useful tool to help managers ensure that their staff have adequate and up to date fire safety knowledge. The tutorial can be used as part of an induction for a new member of staff, or may also be used as a refresher to update the fire safety knowledge of existing staff. On successful completion of the training, a certificate can be printed to keep as a record of training and for CPD purposes. Staff requiring either compressed gas handling or liquid nitrogen handling training are required to complete an initial e-learning module. Following successful completion of the on-line course you can register your interest in attending a further on-site workshop by contacting Claire Wienburg in Safety and Health Services. Please be aware that problems accessing this non-University controlled higher education website have been reported meaning that the link below becomes unusable. We are currently investigating alternative sources of this information and will update this training page as soon as we can. Health and Safety Essentials is intended to complement the health and safety guidance issued by users' own institutions. The resource consists of several modules and short assessments covering a range of topics such as COSHH, laboratory fire safety, handling and storage amongst others. It is aimed primarily at providing postgraduate students and university researchers with the essential basic knowledge needed to work safely in a chemical laboratory. STEP has been developed by the HSE, to provide slips and trips guidance through interactive learning. This package is a simple way of learning about how slips and trips are caused and how to prevent them. This training package from HSE includes quizzes, videos, animations, case studies and interactive sequences to aid learning. After completing this training you will have a greater understanding of slips and trips which will help you to take action and reduce incidents at work. The HSE Approved Codes of Practice and guidance supporting the COSHH 2002, Control of Asbestos 2012 and the Personal Protective Equipment at Work 1992 Regulations expect tight fitting face pieces to be fitted to the user by a competent person as part of the RPE selection process - see HSG53 regulatory guidance (HSE; PDF, 1.5 Mb) for further information. Safety and Health Services arrange, based on demand, for an external accredited RPE face-fit tester to provide on site testing for staff who may require the service. The provider will usually be on site for half or a full day, during which staff requiring fit testing will be able to make an appointment for a consultation (schools and services will be re-charged at the rate advised when an appointment is agreed). To register your interest in the next session please provide your details using the registration form. A suitable date for the next session will be determined and arrangements confirmed with you. If your request is more urgent then please contact Claire Wienburg as this can usually be arranged at extra cost. Please note that ASU arrange their own sessions for users of their facilities prior to access being granted and you should not register for this here.